KS Engineers, P.C. (KSE) provided construction inspection services for approximately two miles of a new two-lane divided highway. The construction of this project was initiated by the New Jersey Department of Transportation (NJDOT) in June of 2003. It included the construction of a new two-lane, 3,333-meter-long divided highway, six bridge structures, six culverts and architectural surface treatments of all bridge abutments, piers and retaining walls. Also included were over 3,600 meters of multi-use paths for pedestrians and cyclists and the planting of over 100 species of trees, shrubs and flowers to restore 29 hec back to its natural habitat for the enjoyment of students and faculty at the Rutgers campus. The construction cost for the project was over $75,000,000. 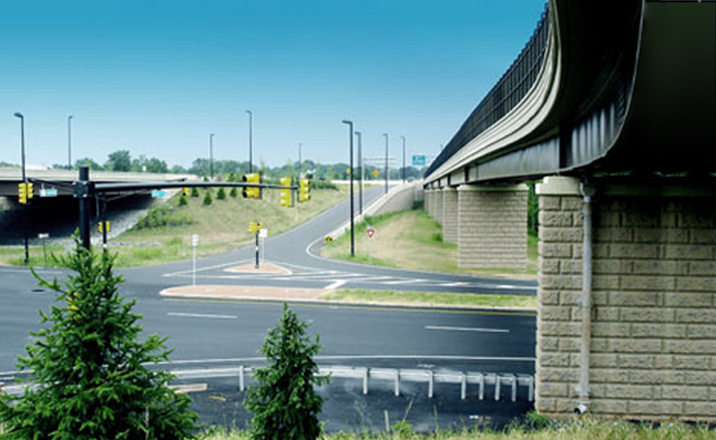 The project was constructed in Piscataway, New Jersey within the domains of the Rutgers University Busch and Livingston Campuses, which added the requirement for minimizing constructionrelated congestion to the already congested roadways and ensuring the safety of all parties. The project also included the replacement of a 96-inch diameter sewer pipe under a new roadway. Trenchless technology was used to install a liner within the existing pipe.